“Out of sight, out of mind” is a phrase that can be applied to energy use, especially for people who aren’t in the industry or (seemingly) don’t have any stake in their use of that energy. This can be said about students at a school or university, visitors to an office or retail complex, or the average person walking down the street. 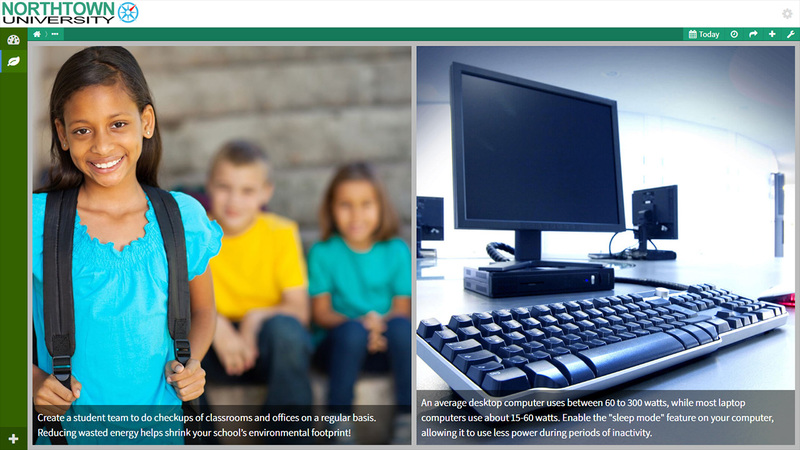 All of us use energy every day for transportation to and from school or work. We live or work in buildings with lighting, heating and often cooling. We consume a lot of energy. The United States consumes about one fourth of the world’s energy resources. When energy is produced from non-renewable fuels, pollutants are released into the air contaminating the air we breathe and ultimately the water too. The more energy we use, the more energy we must produce. Because energy is used all around us, it is our collective responsibility to understand its effect and use it wisely. So how can this be done effectively? This month we’ll focus on how Periscope can educate the individuals who work and play in your facility. 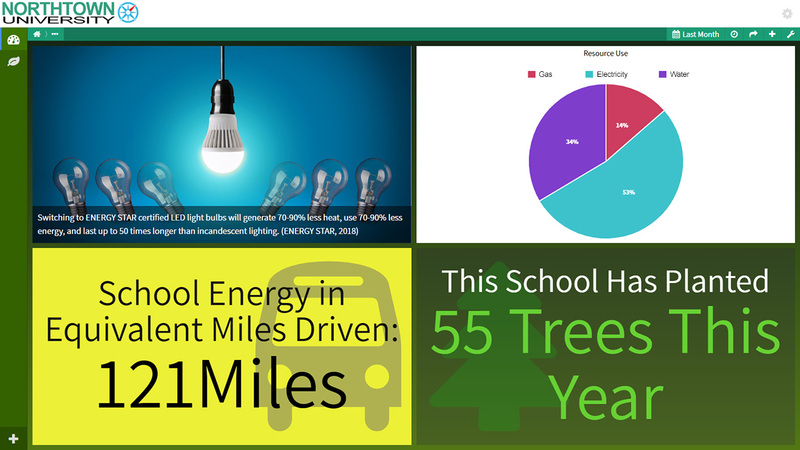 Periscope can assist students and the public on learning the effects of gas, electricity, and water consumption as well as methods of conservation that can be applied to change the way we think about energy use in our daily lives. With a little education and effort, we can reduce and optimize our local, national, or even global demand for energy. Numbers can be confusing without a frame of reference. For students, visitors, or employees it helps to show your data in ways that make it easier to understand. For example, with respect to water consumption how many toilet flushes have been saved? Or how many trees have been planted from a carbon offset perspective? The Key Performance Indicator (KPI) Viewlet simplifies data that might not stand out and equates the data into something that all people can appreciate and understand the impact of. Offering a dashboard that isn’t overly packed with multiple graphs will go a long way in holding the attention of regular people. It’s a good idea to aim for 3-4 viewlets that are easy to understand relatively quickly and provide clear and easy to read titles, or a single view that provides a broad overview of what you’re trying to present. These dashboards should be in elevated places such as the top corner of an entrance way, or a cafeteria and they need to be clear, hence don’t cram too much data so it can be easily seen from afar. Additionally, visitors and administrators generally don’t have much (or any) physical interaction with the computer displaying the data, so the layout needs to get its point across hands-free. Viewlets that are best suited for a lobby kiosk format would be bar charts, gauges, pie charts, KPIs, green tips, or the Map or Tree Map View. 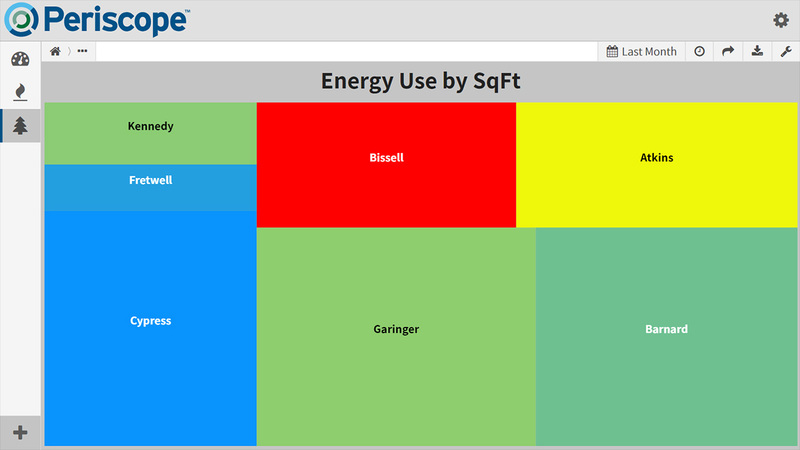 You should always create additional dashboards for the power users of your organization, such as energy or property managers who require interaction and an advanced layout. 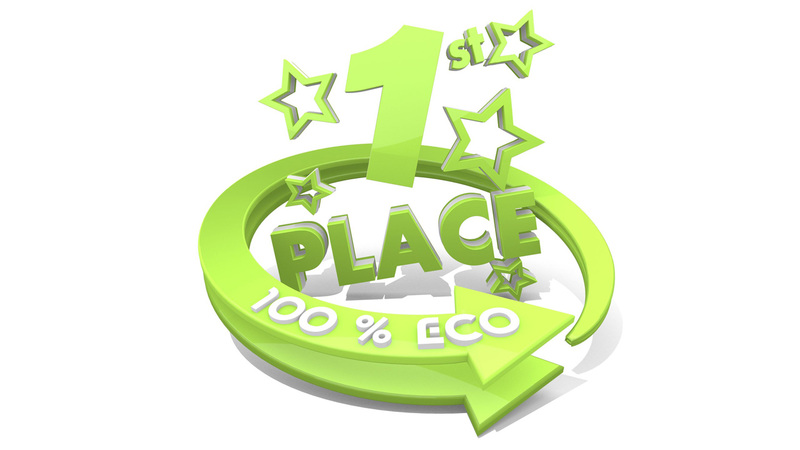 While people are often asked to do their part to conserve energy or resources, you’re much more likely to get an engaged crowd if you can contribute rewards or prizes. Not only will this boost the numbers of people participating in an objective you’re after, it will also add a competitive fun factor that most people could get behind. An example of an incentivization is a university competition between multiple dormitories. Who can save X amount of electricity or water over Y amount of time? The first-place dorm gets discounted tickets to the first game of football season or a Saturday lunch served by the other dorm. Finding a motivation for the participants and using it to your advantage will always be more enticing for participants who aren’t being paid otherwise. With Periscope’s ability to compare normalized data across floors of a building or buildings across a campus, one dashboard can be configured for the competition and then automatically duplicated across the other areas with the respective data of those locations. Be sure to provide HTML5 graphics for each location so everyone can keep tabs of their progress. When John F. Kennedy said “Ask Not What Your Country Can Do for You, Ask What You Can Do for Your Country” during his inaugural address, it was to inspire confidence in the American public that they could make a difference in their lives without solely relying on the government to make things right. A similar mindset applies with an energy kiosk utilizing Green Tips. Asking students, constituents, or coworkers to do their part and conserve can impact the local community. When users get engaged and share their energy and sustainability success, other viewers can relate and be empowered to make a difference in their own homes and communities by performing changes in daily life. Be sure to include users in identifying other conservation efforts including such tips as turning off and unplugging devices or lights not in use and encouraging recycling. Advanced tips such as the benefits of installing rainwater collection or solar panels are also available and can be used to motivate and involve users for future improvement projects. So what’s in store for the future of energy and how we interpret it? What can we expect in the next 5 – 10 years? Be sure to catch our blog next month for our fifth and final part of this series on the Future of Energy Analysis and Education. Stay tuned!